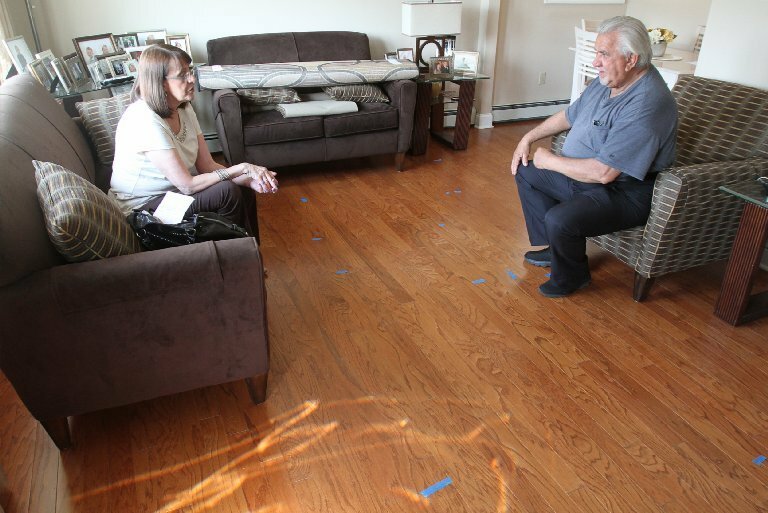 Floodwaters poured into Richard Mitchell’s Lyndhurst home during Superstorm Sandy in 2012. Using grants from the Rehabilitation, Reconstruction, Elevation and Mitigation (RREM) program and payouts from his flood insurance, Mitchell had the home elevated and completely rehabbed. Now, four years later, the work is almost completed. The only problem is the flooring. “We started to notice imperfections with the flooring – not the product itself, but the installation,” Mitchell said, noting the job had a one-year guarantee. He said the flooring looked wavy or loose, and there were gaps between many boards. So he called his general contractor, DSW Homes, which called the flooring subcontractor — Sherwin Williams in Moonachie. Sherwin Williams sent workers to tend to the floor, Mitchell said, and they added nails and staples in numerous locations. 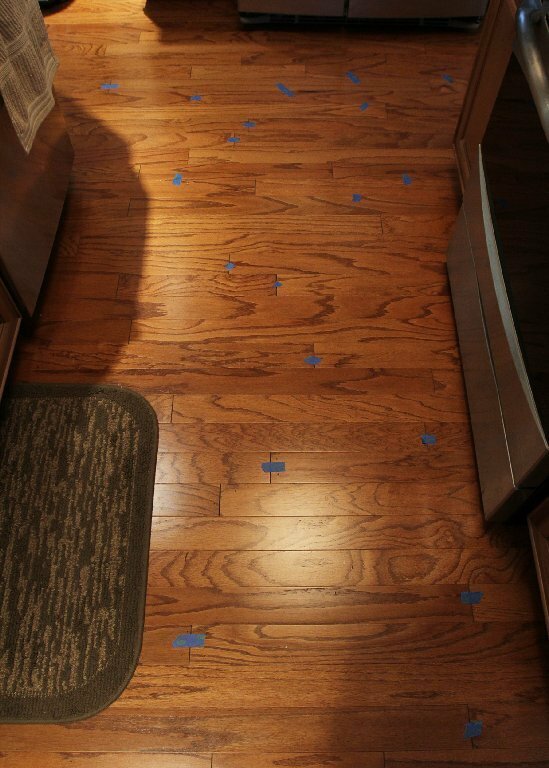 “Hoping they knew what they were doing, we were somewhat satisfied but were we were a little apprehensive about what they did since we were becoming a little more educated about the type of flooring and the way it should be professionally installed,” Mitchell said. Wood flooring is supposed to acclimate to a home’s atmosphere for five to seven days before installation, Mitchell learned. Mitchell said his installers brought in the wood as they did the installation. “No adjustment time was provided, Mitchell said. The fix by the workers didn’t correct the problems, Mitchell said, so he called DSW again. A DSW rep came to look at the floor, and he returned a second time with a rep from Sherwin Williams, Mitchell said. Mitchell said the Sherwin rep “downplayed the severity of the issues” but promised to send back his flooring supervisor and the original installers. The workers returned and put more nails and staples through the flooring, Mitchell said. He feared this wouldn’t fix any spacing issues, and Mitchell’s concern grew. He reached out directly to the flooring manufacturer, Mohawk Industries. “They did say that the adjustment period was crucial to the flooring,” Mitchell said, and Mohawk sent a flooring inspector check out the installation on March 10. The inspector did some tests and pointed out several defects, Mitchell said. The inspector said he’d send a report to Mohawk and Sherwin Williams, Mitchell said. Mitchell asked about also getting a copy, but the inspector said he’d have to get it from the other companies. “They advised me that the remedy would be for the installers to come back and drill holes in the edges of the flooring and then drive nails in there,” Mitchell said. But before agreeing to repairs, Mitchell wanted to see the inspector’s recommendations with his own eyes to be sure the repair was the inspector’s suggestion and not someone else’s. So Mitchell asked Mohawk for the report and for an opinion on the suggested repairs. Mohawk refused to share the report, but it did have an opinion. “The method of repair you asked about isn’t what our installation manager would recommend,” the Mohawk rep said in an email. Mitchell followed up with a phone call to Mohawk, and he said the rep wasn’t too keen on the repair method. Mohawk recommended Mitchell get a second opinion from an independent inspector, but that could cost $700 or more. “I have indicated to both Mohawk Industries and the DSW representative that if Mohawk deemed this to be an approved remedy and if we had no further issues with the flooring, I would be receptive to them proceeding to do so — but, I would really like to see that in the inspector’s report only to satisfy the suspicions I have as to whether it is, indeed, approved,” Mitchell said. No one from any of the companies followed up with Mitchell to discuss the repair further or to schedule work to be done, Mitchell said, noting that several messages left by Mitchell were not returned. That’s when he asked Bamboozled for help. We reviewed the communications between Mitchell and the companies, and we asked the companies to share the status of the case. No one responded to Bamboozled, but Mitchell got a call from DSW. The call ended, and DSW called again that evening to ask if Mitchell would accept new flooring in the kitchen, Mitchell said. He said he asked about the other rooms, and the rep said he’d see what he could do. The next day, DSW said all the flooring would be replaced. It would take about three weeks to order, and then the flooring would have five to seven days to acclimate in Mitchell’s home before installation. We asked DSW about the decision. David Sellers, the director of construction for DSW New Jersey, said when the installers returned to the home, it appeared there was a language barrier. He said DSW said not to nail the wood through the face unless that’s what the manufacturer said to do, but the installer nailed in the flooring again anyway. “Shame on us for not getting a definitive answer,” Sellers said. Sellers said DSW never received a copy of the Mohawk inspector’s report. “It was like pulling teeth,” he said. Then he said he didn’t hear from the homeowner for some time so he thought all was well. But once Sellers heard from Bamboozled, he said, he contacted Sherwin again. “I said, ‘DSW isn’t falling on this. We hired you and you’re the flooring professionals,'” Sellers said. Sellers said he’s requested that a different crew do the new installation. 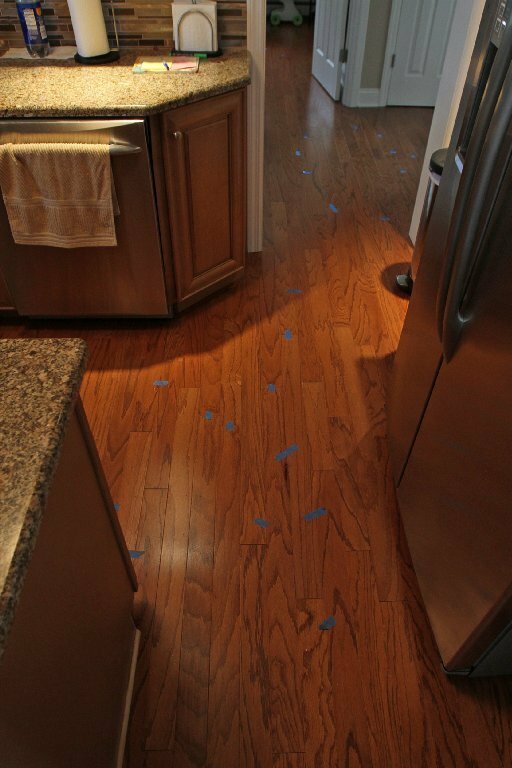 We asked why the homeowner was initially offered only a replacement of the kitchen flooring and later was offered a complete re-do. When we tried Sherwin Williams again, a manager said he’s not allowed to comment, so we tried the parent company. Spokesman Mike Conway said “a problem developed after the floor was installed,” that the company apologized and is now replacing the floor. Conway would not share the inspection report. The new flooring came in quickly and arrived at Mitchell’s home last week for the acclimation period. The installation should begin today.